View our wide range of innovative concrete pouring solutions. 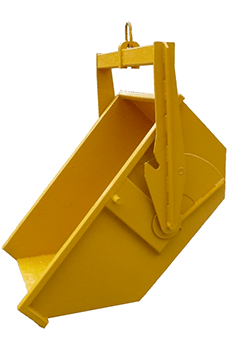 Skips are manufactured to suit cranes and forklifts. Man riding cages designed to carry between 1 and 4 persons. 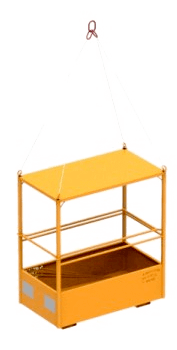 Including an Emergency Rescue Evacuation Cage capable of carrying a stretcher accompanied by 1 or 2 persons. 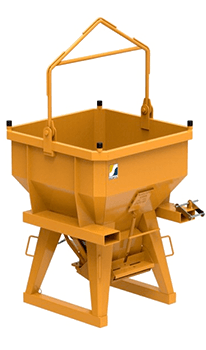 This opening mechanism enables a continuous flow of concrete from the bucket to formwork. A tilting receptacle prevents cement grout leakage. With automatic tilting bale arm. Transport of earth, debris, wastes and concrete on building sites. For exceptional, urgent and non-repetitive work, crane man cages allow the transport of several persons to inaccessible places.